The last thing anybody wants to do is clean their toilet. Is it any wonder? The toilet bowl is probably, hands down, one of the most disgusting and most neglected objects in the house. Unfortunately, any bathroom or commercial toilet bowl cleaner that you use to clean your toilet is full of harmful chemicals that can pose a risk to you and your family, not to mention the environment. 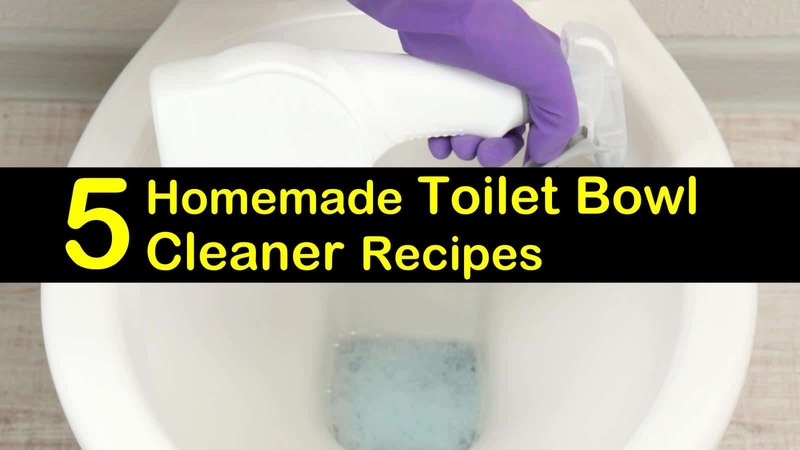 If you are trying to ditch the chemical laden cleaning products and clean your home with natural alternatives, here are some great recipes for homemade toilet bowl cleaner that will get your toilet bowl sparkling clean without the harmful chemicals. Most of the commercial toilet bowl cleaners that you find in the store contain harsh chemicals that can pollute your home’s environment and can be toxic to your family. One of the active ingredients in many of the toilet bowl cleaners is hydrochloric acid, a corrosive chemical that is extremely toxic. When this substance is inhaled, it can damage your nose, throat, and respiratory tract, posing a substantial risk to children, pets, and the one who has to clean the toilets in the house. Using commercial cleaning products in your home, kind of defeats the purpose, as many of the all-purpose cleaner and cleaning products you find in the stores are laden with harsh chemicals that can cause harm to your family. Luckily, there are several natural ingredients, which are easy to find, that you can use to create a DIY toilet bowl cleaner. Making a homemade toilet bowl cleaner gives you the freedom to use the ingredients that you feel are safest for your family and those that are readily available for you to purchase. This deodorizing solution uses the antibacterial properties of tea tree oil to kill the germs in your toilet bowl, as well as those that are on the toilet surfaces. The ingredients are inexpensive to purchase and safe to use around your family. In a glass spray bottle, combine the essential oil and the white vinegar. Spray the inside of the toilet bowl with the mixture, as well as on the toilet seat, lid, and handle. Allow the cleaner to rest for several minutes. Sprinkle the baking soda inside the toilet bowl, and using a toilet brush, scrub the inside of the bowl. Clean the solution off the seat, lid, and handle, using a clean, dry cloth. If you have nasty rings around your toilet bowl, this heavy-duty formula is just what you need. It is a very powerful cleaner very often used after you unclog a toilet to thoroughly clean up any residues. The ingredients in this natural toilet bowl cleaner will leave your toilet sparkling clean while eliminating stale toilet odors. Combine the ingredients in a squirt bottle. Wet the inside of the toilet bowl by either flushing the toilet or swishing water around the bowl with a toilet brush. Pour the entire solution into the toilet. Let the mixture stand for several hours or overnight. Scrub the bowl with a toilet brush and flush to rinse. It is essential that while the cleaner is sitting in the bowl, the toilet is not used. This cleaner uses natural ingredients that won’t leave a harmful residue. It helps to fight odors while leaving even the dirtiest toilet sparkling clean. The abrasive properties of the baking soda help to get rid of stains while absorbing odors. Combine the water, castile soap, and essential oils in a squirt bottle. Next, add the baking soda. Shake the bottle to combine the ingredients. Squirt the inside of the toilet bowl with the cleaner. Allow the cleaner to sit for at least 15 minutes. Scrub the sides with a toilet cleaner brush. Spray the sides with the hydrogen peroxide so it can disinfect and let sit for a few minutes before flushing. Separation of the ingredients is normal. Shake the cleaner vigorously before each use to recombine the elements. The above natural toilet cleaner can also be used as grout cleaner. The abrasive way bakings soda works make it ideal to clean tiles and tile grout. This all-purpose bathroom cleaner tackles all the dirty cleaning jobs in the bathroom. From cleaning and deodorizing the toilet to getting rid of the dried-on toothpaste on the counters, this homemade bathroom cleaner does the job. Mix the baking soda, washing soda, and liquid castile soap in a medium-sized container to form a paste. Add the essential oils and mix thoroughly. Add the vinegar to the mixture. Using a sponge, scoop a little of the mixture out and scrub away. These fizzy toilet bombs are great for keeping your toilet fresh between cleanings and fight any sewer smell in the house. They use three simple ingredients that you can find at your local supermarket and are great for cleaning and deodorize your toilet naturally. In a small bowl, combine the baking soda and citric acid. Add the water and essential oils. To reduce the fizzing caused by the baking soda, you can add the liquid ingredients to a spray bottle and gently mist the dry ingredients. Place a small amount of the cleaner in your hands and squeeze, to test the mixture consistency. If it doesn’t clump, add a little more water. In a silicone mold, pour the mixture into each cell, packing it down firmly. Allow it to dry for several hours. Remove the toilet bombs from the mold. When you are ready to use, simply drop them in your toilet and watch them work. 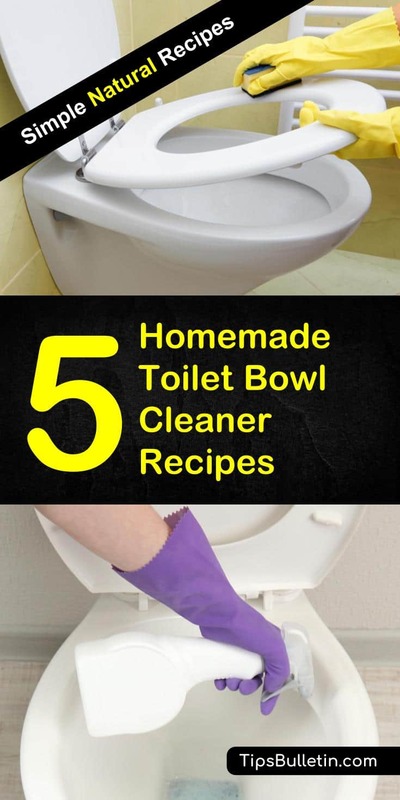 If you are looking to live a healthier life by eliminating chemical cleaners from your home, these homemade toilet bowl cleaners will allow you to accomplish your goals. With a few simple ingredients that are inexpensive and easy to find, you can begin living a healthier life free of harmful chemicals. We hope you found the information in this article helpful. Please feel free to share this article with all your family and friends.